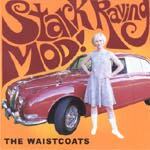 The Waistcoats - Stark Raving Mod! The Waistcoats hail from The Netherlands. They have produced rock solid raw British R&B, maybe like the Eyes vs. the Pretty Things. early Who sounds, twangy reverb, raw Britrock... there's a great version of "Sookie Sookie" and several tracks that just plain ooze sixties mod. A fine adventure in primitivo. Picks: Little MGB, Bongo Time, Pickles, You're Wrong, Package, Little Miss J.A.J. The Waistcoats put in an overdriven garage performance on this intense track. Not very melodic, but well worth a spin or two. Lots of tuff glissandoes and thundering drums. Slightly discordant, like s shortboard beach assault. The Waistcoats hail from The Netherlands. "Bongo Time" is a trashy club organ groover, like Booker T. and the M.G. 's at a frat party... bluesy and tuff, with whirling Leslie leads. "Pickles" splashes between that Memphis sound and early British instros, with the organ in charge. It's quite a fine track. This is a great grimy instro in the niche carved out by the Eyes. Excellent and very raw, with great period drums. Hard driving, relentless, and too cool. "Package" is a thick relentless R&B thrasher... an instro with a real sixties mod feel. No melody, but a fine progression in the primitive sense. I assume from the title that the track is in reference to the Northwest sound, but unlike its namesake, "Little Miss J.A.J." thrashes and rocks. Progressional and garagy.